Caruana and Paikidze are 2016 US Chess Champions! GM Hikaru Nakmura and GM Irina Krush entered into the 2016 US Chess Championship carrying the same hopes and dreams of their competition but with much more at stake: the defense of their 2015 championship titles. Nakamura, who is a mainstay on my beloved Chess.com, has won the US Chess Championship in 2005, 2009, 2012 and in 2015. Krush began the 2016 event looking for her fifth consecutive win, but was stopped short by US #2, GM Nazi Paikidze. Just a few short years ago, I would have considered it insanity to believe that GM Fabiano Caruana would be a member of the US Chess Federation and go from playing for the Italian Chess Federation to winning the 2016 US Chess Championship. Yet, that very thing happened yesterday when Caruana edged out his opponents with a win against IM Akshat Chandra, who is widely known for his monumental propulsion into the stratosphere of chess ability. Chandra, who is considered to be one of the brightest rising stars in chess, finished the tournament in last place with 1.5/11, scoring draws against Jeffery Xiong, Alexander Shabalov, and Nakamura. Caruana owned a slight edge over his opponents entering in to the final round, but showed impeccable drive and determination to win the final round despite being given the black pieces. After his victory, GM Wesley So drew against GM Aleksandr Lenderman and Nakamura drew against GM Ray Robson, earning them the second and third finishing positions respectively. I like to think that GM Nazi Paikidze, the new US Women’s Chess Champion is representative of the new wave of chess champions that are set to emerge in the next few years. Although her name might be new to some people, she has an extensive social media presence where she has advocated for chess, health, and fitness for quite some time. Paikidze’s Instagram and Twitter accounts are regularly updated, which shows that she has found a way to balance the demands of professional chess, staying healthy, and maintaining connection to family, friends, and her fans. As the final round of the women’s section was about to begin, it looked as though WGM Tatev Abrahamyan was set to win, but her 16-year old opponent WIM Ashritha Eswaran shocked everyone by outplaying her opponent and scoring a devastating win. Paikidze played exceptional chess throughout the event with five draws and six wins. In what could be considered a Cinderella event, Paikidze’s final victory coming against last year’s champion, Irina Krush. 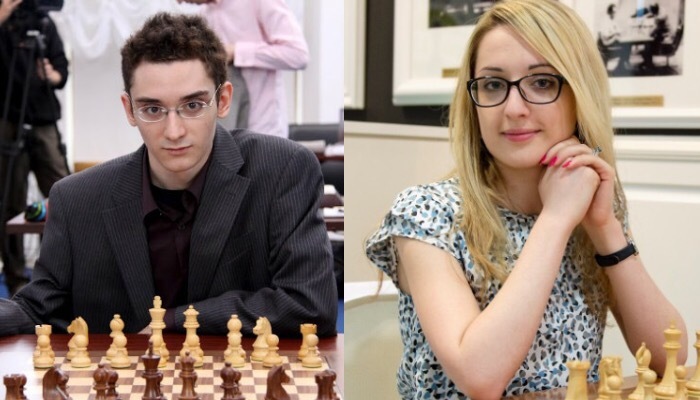 Congratulations to GM’s Fabiano Caruana and Nazi Paikidze for their victory in this year’s United States Chess Championship!